Flowing the Porsche 993 twin turbo 4WD and the New Beetle. Both vehicles have very curved upper surfaces, where the design dilemma at the back of the car is the trading off of a smaller wake for greater lift and drag - or choosing not to, as the case may be. 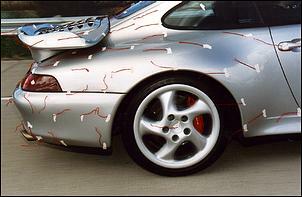 The front of the Porsche is covered in attached flow. Of course, given that the classic 911 shape has probably spent more years in a wind tunnel than any other generic car shape, maybe that's not surprising! But it's especially interesting to see how the flow remains attached on the top of the guard, even directly after what appears to be the sharp transitional change from the headlight to the upper surface. Note also the flow into the small grille (there's one each side for the oil cooler and air con condenser) in the lower spoiler in front of the wheel. A close-up shows more clearly the attached flows around the nose. Especially impressive is the attached flow on the side of the headlight closest to the camera - often in cars that tight transition around the corner will cause a separation bubble. 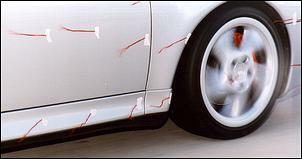 Note the flow of air straight past the guard opening - in most cars the wheel-well is a low-pressure area and you'll see the tufts being sucked into the opening. 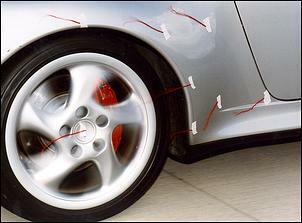 As with the other cars wool-tufted, there is some turbulence directly behind the flared wheel arch. It's interesting to see the airflow passing from the side of the car to its underneath area - despite the wide side sill panel. 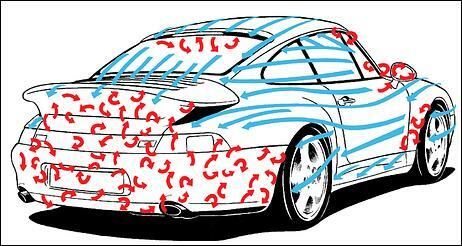 This flow may be promoted by the Porsche's flat undertray. 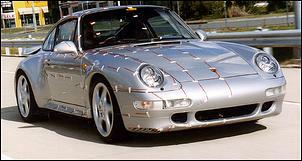 This picture shows a number of interesting aspects of the 993's airflow. As with the other cars, behind the rear vision mirror there is quite major turbulence, which can be seen by the tuft behaviour on the door glass. Also, the airflow wrapping around from the door window, past the gutter and towards the roof does not stay attached - look at the two tufts standing almost straight up! However the flow from the windscreen onto the roof remains attached, while quite oddly the airflow on the glass behind the exposed windscreen wiper doesn't look turbulent in any of the photos (it's wise to make a judgement based on several shots as the camera can capture a tuft in a atypical position) - instead it always indicates an airflow parallel with the wiper. 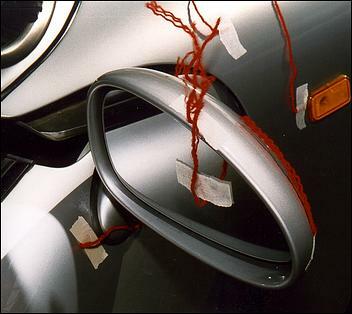 The turbulence surrounding the fancy looking mirror is obvious in this shot of the wool tufts after the car had been tested. Note much can be done to decrease mirror wake, except to use TV rear vision, an approach often used on extreme low-drag concept cars. Further back along the side of the Porsche, the smoothly curved bulge of the huge rear guards keeps flow attachment across their transitional shape. Note also that in all the photos (including many not reproduced here), the behaviour of the wool tufts positioned on the centre of the front and rear wheels show smooth flow across their front faces. A lot of interesting things can be seen here. Firstly, the flow on the side of the rear bumper, as outlined above, is turbulent. In other words, at that level the wake of the car comprises the full width of the car. (Most cars use 'boat-tailing', where the rear of the car narrows in plan-view in order that the wake is reduced in width. But for this to work, the flow must stay attached as the narrowing occurs!) Also turbulent is - as you'd expect - the area at the very back of the car - lower than the level of the rear spoiler, and the full width of the pillar supporting it. But reducing the area of the wake is the attached flow that has been cleverly allowed to flow through on the upper part of the guard. When viewed from directly behind, rather than the wake area comprising a rectangle, it is wide at the bottom (the full width of the bumper), the width of the car across the taillights, then much narrower where the spoiler support is. 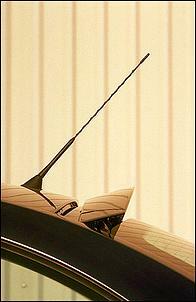 The overhanging spoiler then creates its own minor wake element. If the spoiler were solid down to the guards, the wake would be much bigger, and so with this design, drag is reduced. The flow on the roof is laminar, but the transition to the rear window is poor. 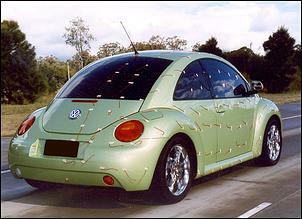 The added high-level brake light causes a whole line of turbulence across the top of the back glass, before the flow re-attaches itself. Look at the tuft in the upper middle that is actually being blown forwards by the swirling turbulence! However, by the time the flow reaches the rear engine cover, the flow is perfectly attached. As a result of the massive engine cooling fan (factory spec is 1210 litres per sec at 6100 rpm!) and the low-pressure air exits (the air heated by the radiators is directed onto the tyres), the flow into the engine bay through the intercoolers is very strong. Of course not all the airflow over the top of the car disappears into the engine bay, for as the tufts on the trailing edge of the spoiler show, some air is leaving at this point. In this Dave Heinrich view the flow pattern over the rear three quarters of the car is shown. The turbulence around the A-pillar (still equipped with an exposed gutter!) and behind the front wheel are two blemishes on the flow over the front panels. The added high-level rear brake light moulding apparently never made its way into the wind tunnel, while the flow into the louvres on the engine cover is massive. As can be seen, the wake extends the full width of the car - the narrowing rear bumper doesn't keep the flow attached at all behind the rear wheels. Note also the unusual flow pattern across the wheel openings, where the flow is not drawn into the wheel-wells. 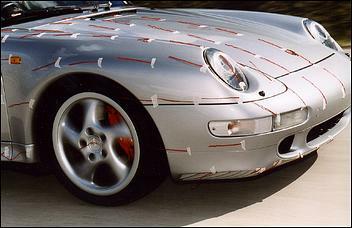 The aerodynamic development of the 993 reflects the car's odd history - it is a certain very characteristic shape which generates major lift if unadorned with aero aids. 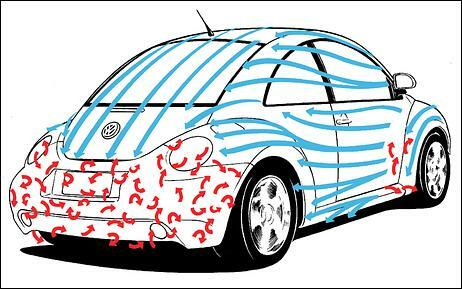 In addition to counteracting this, there is also a need to get major amounts of cooling air to the rear-mounted engine (it's purely air-cooled, remember). 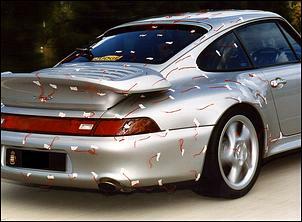 The 993 twin turbo has a factory quoted Cd = 0.34 which is a quite good for a car that also sticks to the road at high speed. The drag coefficient probably benefits substantially from the car's full-length flat undertray. But while Porsche engineers had to at least to remain a little faithful to a philosophical shape which over the years actually changed massively, in the case of the New Beetle, the shape was the single most important aspect to get right. And for sales reasons, not aero ones! Nope, the New Beetle and the Porsche 993 might have a weird relationship in their forbears' original genesis, but the aero end results are as different as their on-road performance. With a factory quoted drag figure of Cd = 0.39, the New Beetle is at least 19 per cent better in drag than the old Beetle (last versions had a factory drag figure of 0.48!). 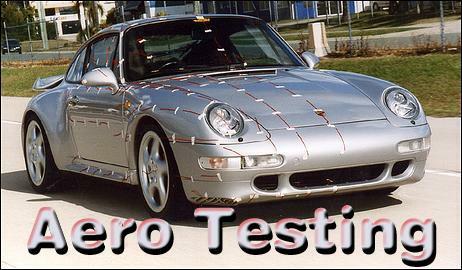 But what about all of the sophisticated aero development that has occurred since? Couldn't they do better than that? Well, in this case, having to hold true to a certain historical shape causes major, major limitations for aerodynamics. As we've got used to seeing in these wool-tuft pics, the flow across the bonnet is attached (that wriggled tuft is just stuck in that position). The flow up the windscreen and onto the roof is also fine, as it is down the side of the car (directly after the bulging guard excepted). Even the flow from the windscreen around onto the side glass past that sharp-edged A-pillar isn't bad at all. So what makes the Cd figure so neanderthal? So the problem must be at the back? And it is. But it's a different problem to that which we've seen before. Here the flow remains attached right down to the line of the guard/boot opening. And this results in a very small wake for the (it's larger than you'd think) size of the car. But it also means that the airflow wraps in one long curve from the base of the windscreen right around over the top of the car to nearly the rear bumper. Aeroplane wing, did you say? And not only will this shape have major lift (without an undercar ground-effects tunnel, anyway; and I looked under and didn't see that), but much of the force will be upwards and rearwards - creating that monster drag. In this view the size of the small wake can be clearly seen. Also visible is that attached flow from the roof all the way down to the bumper level. 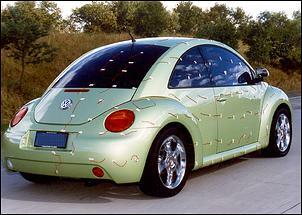 We have not been able to find Clf (coefficient of lift, front) and Clr (rear lift) figures for the New Beetle. But as we have suggested, we'd be astonished if they are not very high - rear lift especially. 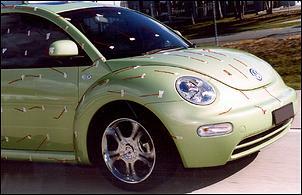 In fact, after the wool tuft session on the Beetle had finished, we gathered around the car commenting on what we'd seen. In that discussion we suggested that a spoiler - which could be used to break up that attached rear window flow and create a clean separation point - would be best placed at the top of the rear glass. It might even reduce overall drag - despite the much larger wake that would then result. The raised New Beetle spoiler would create non-attached flow on the rest of the car's rear, making for a bigger wake but stopping that attached flow over those curved surfaces which creates so much lift. It would be interesting to find out if, with a constant accelerator position, the car is faster or slower with the spoiler up. 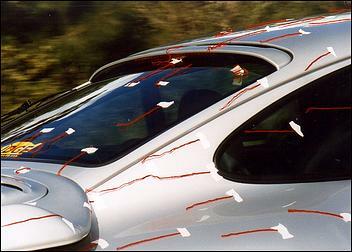 Fascinatingly, the car also automatically closes the sunroof before spoiler deployment! 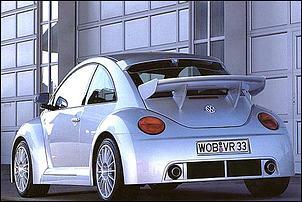 And for something even more extreme, just look at the V6 Beetle RSi. 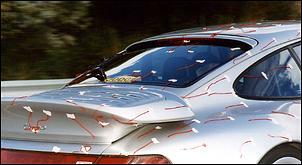 Its huge rear spoiler and flow-directing upper window attachment are said to give 77kg of downforce at a massive 250 km/h - a pretty academic figure when that's apparently 25 km/h faster than the car can actually power itself to.... Drag also rises from the factory 0.39 to 0.40! 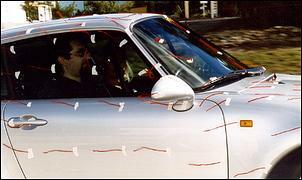 But again, the wool tuft testing shows why the huge spoiler is both needed and why it is positioned where it is. 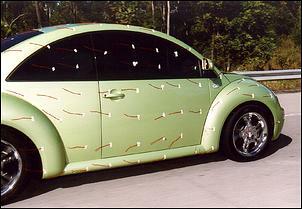 Incidentally, one media test of the massively spoiler'd RSi Beetle said that on the autobahn the car still "displays a lack of stability"! Next week - smoke-stream testing in the DaimlerChrysler wind tunnel!